As an avid bun lover (of both kinds), I get immense joy from getting fresh buns at my local bakery. After becoming aware of our plastic waste problem; the bakery, once my version of a kid in a candy store, became a minefield of plastic to avoid. Every trip to the bakery resulted in a lot of plastic trash the moment we get home, but as far back as I could remember, bread was always brought home in plastic. Nowadays, bakeries have taken it a step further. The joy of picking up fresh bread into your tray has been replaced by buns already pre-wrapped in individual plastics, making shopping zero waste that little bit more tricky. Regardless, I was sure there is a way to go plastic-free. All I needed was a strategy. Cotton bags and containers are your best friend here. I personally bring a large container. Cotton produce bags (which you can sew yourself from old t-shirts) will be easier to carry around (since they can be folded small and compact) and easy to wash. These will be where you place your buns in instead of an individual plastic. If the bakery has unwrapped breads and buns on display, great! I fill them straight into my containers and cloth bags and head to the checkout counter. But if most of their baked goods are pre-wrapped in plastic, not to worry. Many bakeries bake fresh throughout the day, so at any one time there is likely to be a batch fresh out of the oven cooling on trays, before being wrapped. I usually ask the bakery assistants to help me out in this, and get the fresh buns that have not been wrapped at the back. If they don’t bake fresh throughout the day, your best bet is to go early in the day. Catch the store before they pack them, they usually have to cool the buns down on trays for about an hour before packing. I don’t keep tabs on my bakeries’ timing, so what I do instead is limit my choices to the buns and bread that haven’t been packed or those naked in display cases. I keep my bags and boxes open during payment so that the shopkeeper can quickly identify them. Payment is much faster this way, especially when the cashier isn’t trying to bag up the buns at the same time. Win-win for both of us! 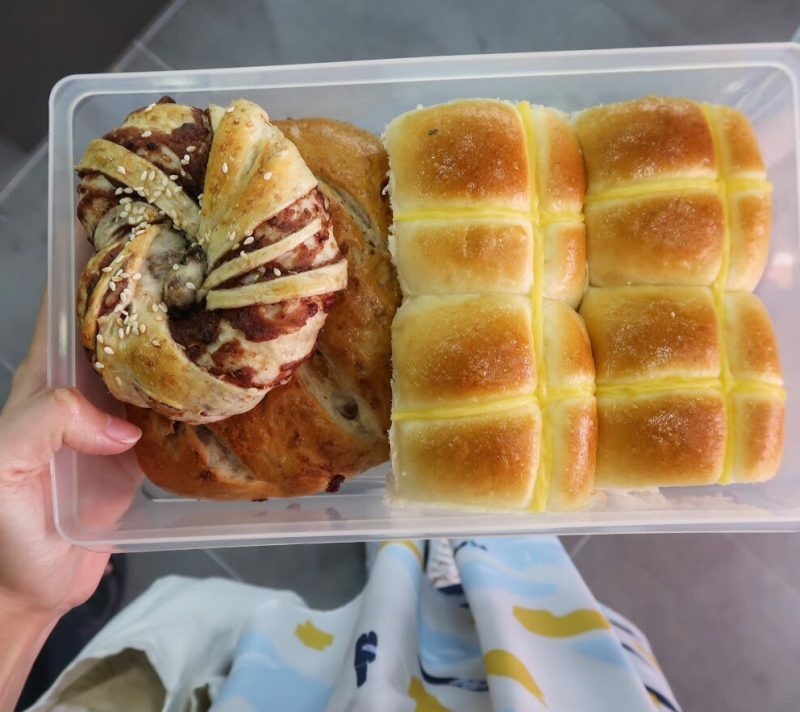 Last weekend, I tested out my strategy again when I attended the opening of Butter & Olive Pastry House in Cheras Selatan. At first I kept to the unwrapped buns in covered display cases, but as luck would have it, a shopkeeper was packing a fresh tray of potato buns into plastic wraps. I caught her just in time to get one right into my box. They were also glad to help me with other trays of fresh bread coming out of the oven at the back of the store, I just needed to request them. Whether the bakery is busy or not, all we need to do is ask politely and be patient. Bakery assistants are usually happy to help. It’s a simple way to show not only the bakery, but also the other customers around that a plastic-free way is easy and achievable. Try it, and keep enjoying delicious baked goods, the plastic-free way.